Submit an application to attend GapSummit 2019 as a Leader of Tomorrow! Apply Here! We are seeking candidates who have demonstrated evidence and passion for solving pressing challenges in biotechnology through past leadership experiences and academic/professional endeavors. The quality and ingenuity of ideas expressed in an applicant’s application will be heavily weighted during the selection process. Successful applicants show innovative thinking and creativity in addressing the questions relating to the “gaps” in the bio-economy. We are welcoming applications for Leaders of Tomorrow from all regions of the world. The main requirements are: early career, speak English, have an excellent academic and/or professional track record, and have strong written and oral communication skills. Past Leaders of Tomorrow are ineligible to apply to GapSummit 2019. Candidates invited to GapSummit 2019 as Leaders of Tomorrow are expected to participate in the Voices of Tomorrow Competition and commit to attending the full duration of the conference. 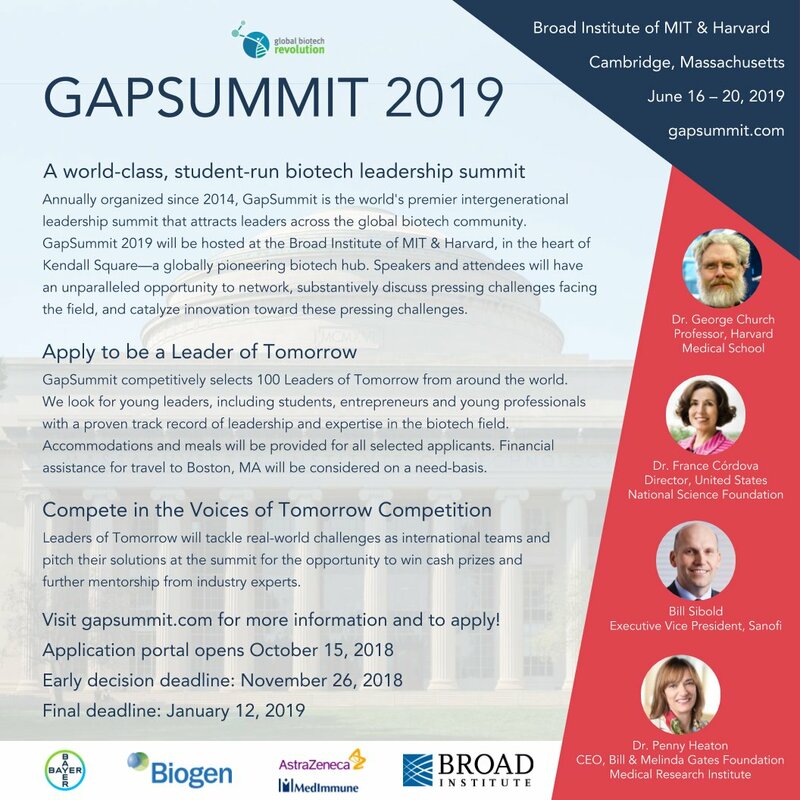 There is no fee to attend GapSummit 2019 for successful applicants. GapSummit 2019 will fully cover accommodation and meals for all Leaders of Tomorrow during the conference. Outstanding individuals at the start of their professional careers from top global organizations, including industry, non-profits, government, etc. Individuals with a passion for advancing the biotech industry and addressing grand challenges beyond solely developing their own careers.